Do any of you wear the Gath helmet with visor? If so how do you like it? I lost another pair of sunglasses in the drink while down at La Ventana. I don't wear my current helmet enough because it doesn't fit well. It is a Protec Ace. Perhaps I can solve two things at once. I'm wondering whether it'll start fogging after a few waterstarts. I've been using Gath helmets for many years, but they have all been sans the visor element. They are an outstanding product that I highly recommend. Regarding the visor element, I've always shied away from anything in front of my eyes that would collect water spots, and that would include sunglasses too. Yet, I understand that many folks don't seem to have a problem wearing glasses, especially if they need prescription lenses to see well. Have you tried using Croakies? They fit over the arms of your glasses and fit around your neck, and they can be fitted with a float to prevent sinking. Now, if you're wearing a Gath helmet, with a Croakies attachment on your glasses, they are not going anywhere. Also, wearing the Croakies out and about on land, you can take off the sunglasses while indoors, and they will hang from your neck so you will avoid losing them easily. from big jumps gone bad without helmet would have been knocked out before I hit the water. Have you tried using Croakies? They fit over the arms of your glasses and fit around your neck, and they can be fitted with a float to prevent sinking. Now, if you're wearing a Gath helmet, with a Croakies attachment on your glasses, they are not going anywhere. Also, wearing the Croakies out and about on land, you can take off the sunglasses while indoors, and they will hang from your neck so you will avoid losing them easily. I was wearing a retainer just like the Croakies (That is a name brand is it?) when I lost my glasses. I took a hard catapult that knocked my glasses clean off my head (including my hat with chin clip fastened). I saw the retainer floating near me and when I grabbed it to my surprise my glasses were no longer attached! I regularly wear sunglasses and never had an issue with fogging. You're already using the best helmet (Protec Ace), maybe you need to get the right size. The other thing you need to do is get some water sports sunglasses. I bought two pair at the kiosk in the local mall for $25; they work great, they float, with a croakie they will NOT come off when wearing my helmet, and if they get busted....who cares, they only cost $12.50. I think the Gath helmets are....not optimal: they look weird and restrictive. I use the Gath helmet with the adjustable visor as my "rainy day" helmet. With the visor just at the right level, it keeps the rain out of my eyes quite well (which matters because it usually has to blow 25+ before I sail when there's rain in the forecast). Most days, I wear glasses, but when it's raining heavily, the drops on the glasses really reduce vision, so contacts + Gath helmet are best. Unfortunately, though, my Gath helmet is a bit uncomfortable at the back of my head. It also does not work with headphones, which I sometimes use when speedsurfing to hear my speed. May just be my head shape, though - there's another windsurfer at my home spot who wears a Gath helmet almost every session. like a ski boots, you choose not the ones that looks best; but the one that fits the best. Gath was not a great fit for me. 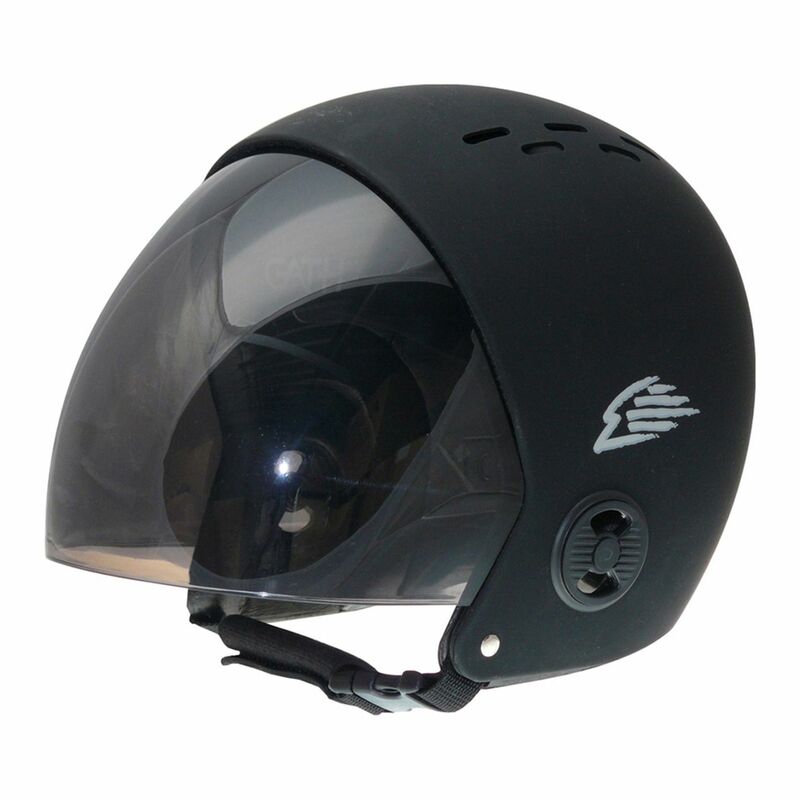 Gath does offer two different design concepts when it comes to their helmets. There are the ones that are a one-piece shell that covers the ears (and that includes the visor model depicted in your photo), and then there is the one where the ear covers are an attachable accessary that you can use or not. With the one-piece helmet design, it would be virtually impossible to lose your sunglasses using the Croakies. Of course, the Croakies should be threaded deeply onto the arms of your sunglasses to work effectively.